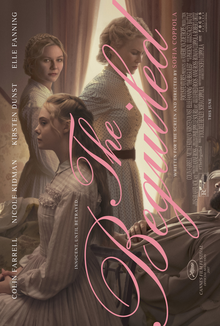 ‘The Beguiled’ is a Sofia Coppola directed remake of a 1971 Don Siegel/Clint Eastwood outing, about a wounded soldier who is taken in by a group of women in the midst of the American Civil War. The group of woman all inhabit a small girl’s school in the deep south and as war rages around them, they have minimal contact with anyone else besides fleeting visits from passing Confederate soldiers. Their sheltered existence is interrupted one day when one of the girls ventures too far into the woods and discovers a wounded soldier (Colin Farrell), who turns out to be a Corporal John McBurney from the Union Army and it raises a variety of questions for Nicole Kidman’s matron as to how to deal with the situation. Coppola’s film is very atmospheric and superbly paced, clocking in at 94 minutes but feeling much quicker, and it’s driven by some superb performances from Farrell and Kidman as well as Kirsten Dunst and Elle Fanning. The title refers to the way in which all of the women are charmed by Farrell’s soldier, partly due to his charismatic and slightly manipulative way of conversing with them (particularly when alone) but more so down to the fact he’s likely the first man they’ve interacted with for some time. As he starts to bond with each of the women, the school starts to become filled with jealousy as the women start to fight for his attention, and McBurney plays the situation to his advantage, knowing he is in a precarious position as a Unionist soldier in Confederate land. The film does assume a lot of prior knowledge of the American Civil War and some of this may prove a little challenging to audiences not as well versed in the history, although it’s a minor point and not enough that it should put anyone off seeing the film. The film builds superbly but it falls flat in the final act with a conclusion that feels a little disappointing given how composed the build up was, and I must confess, it did impact on my overall enjoyment. That being said, ‘The Beguiled’ is a solid movie with some really strong performances (Farrell especially) and it’s a good film to spend an hour and a half with.